As we slowly start to transition from spring to the warmer days of summer, this salad makes frequent appearances on the supper table, especially when we dine al fresco. My husband and I enjoyed a variation of this salad while celebrating a wedding anniversary on Cape Cod a few years ago. Our hosts at The Liberty Hill Inn Bed & Breakfast served this as a breakfast side dish (minus the avocado). I was so smitten I came home to recreate it (with my own twist). I simply couldn't get enough. A colorful medley of sweet and juicy Wild Wonder tomatoes is tossed in a light and zesty vinaigrette and served alongside sliced avocado. (Is there anything more wonderful than slicing into a perfectly ripened avocado?). Topped with crumbled feta and fresh parsley, this simple, yet flavorful gluten-free salad is a lovely side dish for any meal - brunch, lunch, or dinner. You can certainly make this salad your own. Don't have feta on hand, or not a fan of feta? Use crumbled goat cheese instead or skip the cheese entirely. In place of the gourmet tomato medley you can use cherry tomatoes or even sliced beefsteak tomatoes. When preparing the vinaigrette, make sure to use gluten-free dijon mustard as some mustard brands include vinegar that's been distilled from gluten grains. This side dish would be delicious served alongside roasted chicken, a hearty white fish, or even grilled tofu kebabs. After removing the pit to slice the avocado, keep the pit! There are some very handy uses for that avocado pit you would not expect. In a small bowl, combine the minced shallot, gluten-free dijon mustard, maple syrup, and chopped parsley. Very slowly whisk in the olive oil until emulsified. Season with salt and pepper to taste. Set aside. Wash and pat dry the gourmet medley tomatoes. Slice the small tomatoes in half, and quarter the larger ones. Place the tomatoes in a large mixing bowl. Pour half of the vinaigrette over the tomatoes, and toss to combine. Arrange tomatoes in the center of a serving platter and drizzle additional vinaigrette over top, if desired. 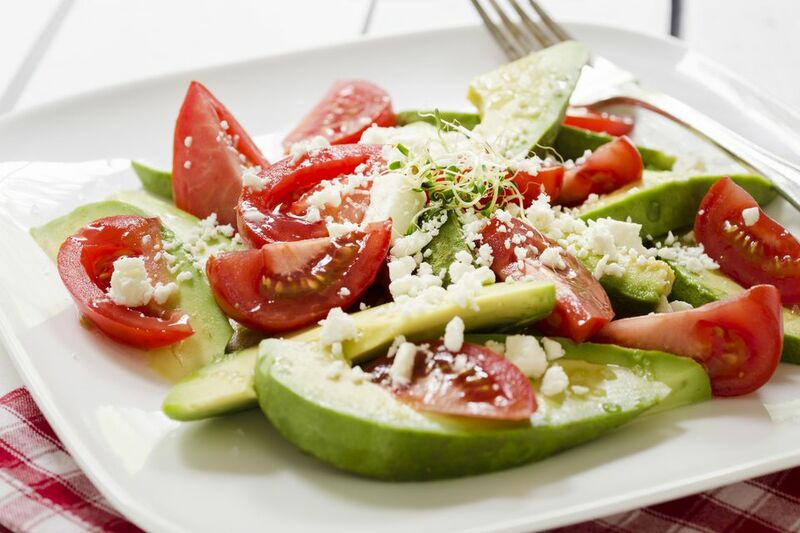 Arrange avocado slices around the tomatoes in a single or double layer. Garnish the entire dish with crumbled feta and chopped fresh parsley. Alternatively, you can simply toss everything together and pour into a bowl or onto a plate.